The chambered nautilus is an amazing creature. Unfortunately, it is sought after for its beautiful coiled whitish shell lined with tan markings and and shiny interior. Some people keep them in salt water fish tanks. I don’t encourage collecting any living seashells, in fact it is usually against the law. The species encountered near Australia can be almost 11 inches long. Often you will find pictures of the shell sliced down the middle to show the swirl of “chambers” inside. The cephalopod begins it’s life with 4 chambers and builds a new chamber to move into as it outgrows the old and then uses these chambers to fill, or empty, with sea water to control it’s buoyancy. It hides in the deep in the ocean during the day and will rise at night to eat. The coloring of the shell – white underneath and irregular dark stripes on top – help to camouflage it from predators. During the day, while it’s down near the ocean floor, a predator will have a hard time seeing the Nautilus because of the dark, striped top part of the shell, which is likely to blend with it’s surroundings. Likewise, at night, as the Nautilus rises toward the surface, if prey is circling below, the white underneath part of the shell will more readily blend with the lighter ocean water. This effect is called “countershading” and it applies to many forms of sealife including penguins and dolphins. 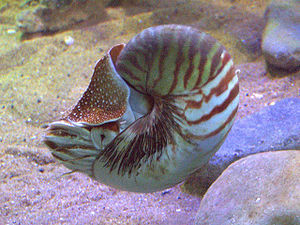 Oliver Wendall Holmes was apparently inspired by this creature and wrote a poem entitled, “The Chambered Nautilus”.